Sunrise Fluid Power Inc. has been manufacturing hydraulic products and equipment for more than 28 years. Delivering machines to over 50 countries around the world each year, SUNRISE has installed thousands of machines in the United States. 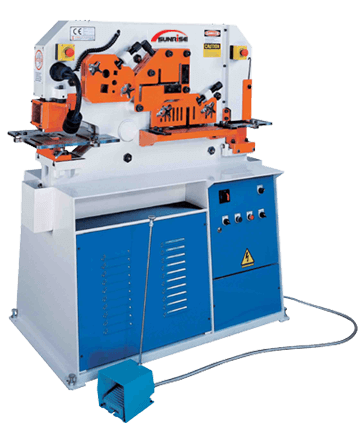 The SUNRISE Hydraulic Ironworkers are designed with multi-functions to save labor, time, energy and cost. This versatility aspect allows the SUNRISE Ironworkers to meet the diversified needs of the metal fabricating industry. Trilogy Machinery offers 100% factory authorized service and support as well as a full stock of spare parts and accessories from a staff with over 120 years of ironworker experience. The “Efficiency Package” is STANDARD and INCLUDED on all SUNRISE Ironworkers! The IW-50M has four standard stations, capable of a wide range of applications. 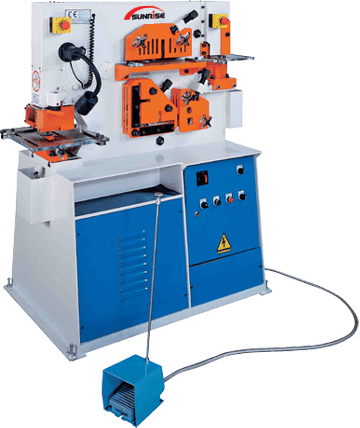 the punching station can be converted into a notching station. The IW-50M is heavier and stronger than other competitive machines. This durable and economical model is perfect for small job shops with a limited budget. 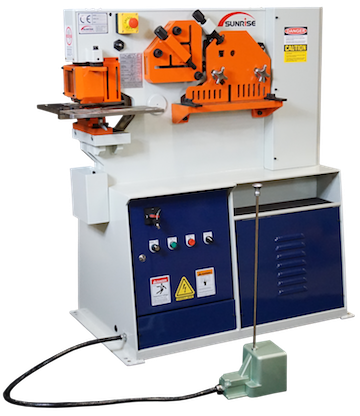 The IW-55A features a vertical moving ram at the punching station which improves the punching result and enables the use of optional tooling such as pipe notching and bending tools. The square/round bar shear is a stand-alone station with possibility of optional channel shear and section bar shear tooling. This model also features angle shearing and bar shearing stations. The IW-66H features a “Z” shaped aperture at the angle shear station, which makes this model capable of doing both internal and external miter shearing on angles. The round/square bar shearing on this model is a stand-alone station that has a large shearing capacity.